People on the Crochet Partners list recently had a long discussion praising the superiority of crocheted and knitted dishcloths to store-bought dishcloths. So I crocheted a dishcloth. When I used it, I experienced an unexpected sensory memory. This crocheted dishcloth felt just like the dishcloths I grew up with. I immediately made a few more so I could have a whole supply! You shouldn't use acrylic yarns for dishcloths. The acrylic doesn't absorb very well, and it doesn't dry out well, either. Cotton yarns are much better. 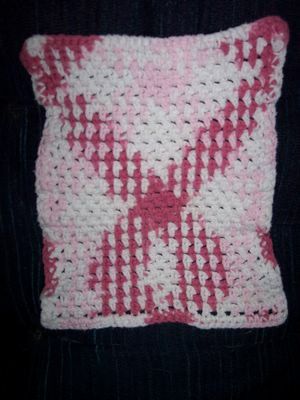 I used Lily Sugar'n Cream and Bernat CottonTots. 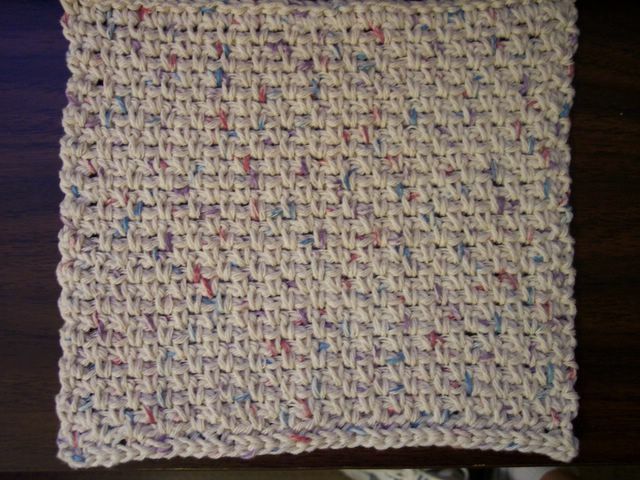 The CottonTots makes a softer fabric than the Sugar'n Cream, and I think the Sugar'n Cream makes a better dishcloth for this reason. The CottonTots would be better for clothing, though. You can click on the pictures for a larger view. 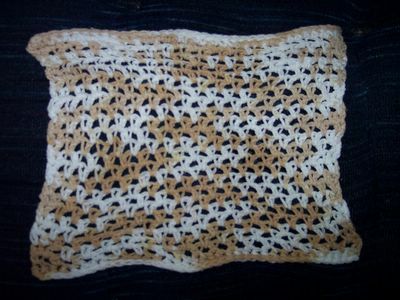 Above is a newly made dishcloth, before going through the washing machine. The dishcloths in the rest of these pictures have been through the washing machine a few times and are holding up well, so far. The dishcloth above is made from Sugar'n Cream. It's an earlier version of the pattern given below. This dishcloth is made from CottonTots. Its texture is softer than the Sugar'n Cream. This Sugar'n Cream dishcloth is currently in use at my sink. You can see how the dishcloth expands and stretches when it's wet. 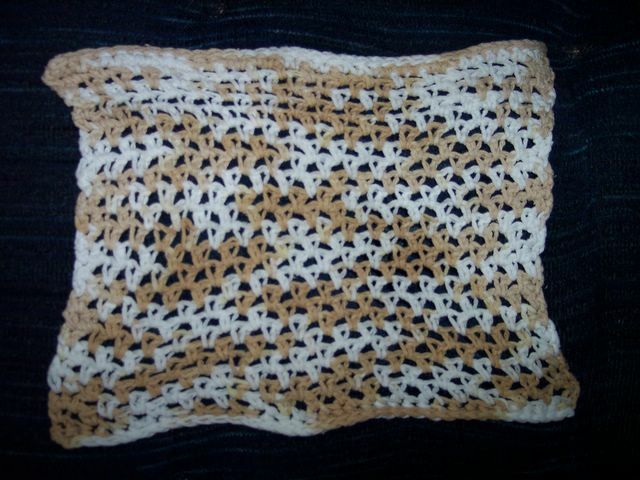 This is a great trait for dishcloths, not so great for swimsuits! This pattern is extremely easy, excellent for a beginner. Gauge isn't important, so use whatever hook feels comfortable to you. 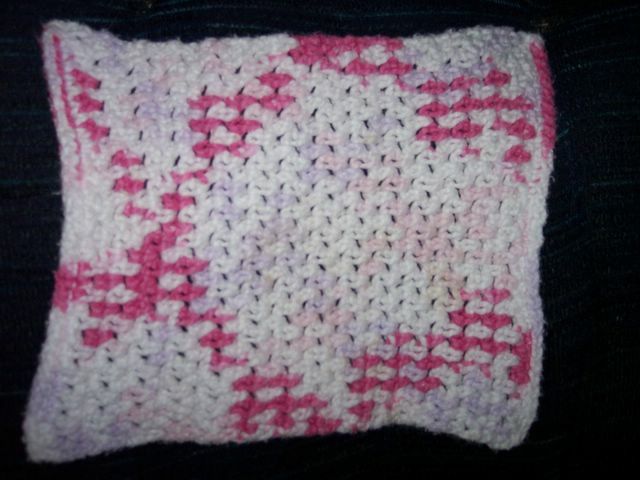 I make my dishcloths approximately 8.5 inches square. This is easy to measure without a ruler if you have a piece of 8.5" x 11" printer paper handy, perhaps the page you've printed out your pattern on! I like to have a row of slip stitches on both ends (top and bottom) of my dishcloth to give it a firm edge. To get a row of slip stitches at the beginning, you'll need to leave a really long tail when you start. I also like to begin with a "foundationless" sc. This allows you to start making sc's right away without having to make a long foundation chain. Okay, so this isn't such a big deal for a little dishcloth, but this method really saves a lot of time when you're making an afghan that calls for a foundation chain of 200 stitches! 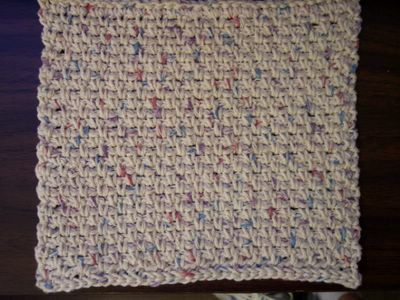 A dishcloth is a good item to make to practice foundationless foundation rows. Josi Hannon Madera has great pictures showing how to do this. Josi calls it the "Double Base Chain Stitch." This site also gives pictorial instructions for other stitches, including the Triple Base Chain Stitch (foundationless double crochet). Basically, you'll be making a chain stitch at the base of each single crochet, then you make your next set of stitches into that chain stitch. Follow Josi's pictures while you work the foundation row below. Measure off 5.5 to 6 times the width of a sheet of paper (8.5") to make a long starting tail to use for slip stitches later. Tie your slip knot at that point. Be sure to work with the ball end of the yarn now, not the tail end. Foundation Row 1: Chain 2. Insert hook into second chain from hook, yarn over and pull through one loop (ch st made); yarn over and pull through both loops (sc made). *Insert hook into the chain stitch you made, yarn over and pull through one loop (ch st made); yarn over and pull through both loops (sc made). Repeat from * until your chain is about 8.5" long and an odd number of stitches. Ch 1, turn. Row 2: Sc in the first sc. *Ch 1, skip next sc, sc in the next sc. Repeat from * across. Sc in last sc. Ch 1, turn. Row 3: Sc in the first sc. *Sc in the next ch-1 space, ch 1, skip next sc. Repeat from * across. Sc in last sc. Ch 1, turn. Row 4: Sc in the first sc. *Ch 1, skip next sc, sc in the next ch-1 space. Repeat from * across. Sc in last sc. Ch 1, turn. Repeat rows 3 and 4 until dishcloth is almost 8.5" long. Next row: Sc in each sc and each ch-1 space across. Turn (do not ch 1). Last row: Sl st in each sc across. Fasten off. First row: With the long beginning tail, sl st in each sc across foundation row. Fasten off. Weave in the two ends. Wash your dishcloth before using it. Now go wash some dishes! I mentioned a while ago that we'd joined a health club. 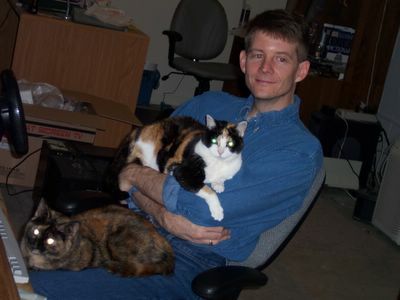 Ron has spent the past several years being a couch potato—or more accurately, a computer chair potato. The only real exercise he got was cutting the grass once or twice a week during the summer and occasionally shoveling the snow off the driveway in the winter. He was out of shape and was carrying a few extra pounds. We joined the health club around Thanksgiving, and since then Ron has been working out three or four days a week for about two hours each time. He hasn't changed his diet at all. But he has managed to lose over twenty-five pounds, and he's still losing. He's lost the pudginess around his waist and built muscle everywhere. Every time I look at him these days, I do a double-take because the change has occurred so quickly. I am really proud of him for working so hard at this. Ron is cleverly imitating a kitty condo. I've been pretty busy lately, so I haven't updated in a while. Sorry! Ron and I just celebrated our 21st wedding anniversary on St. Patrick's Day. I have been fortunate to be married to my very best friend. The term soul mate is often tossed around carelessly so that it's devoid of actual meaning, but Ron is in fact my soul mate, "a person who is perfectly suited to another in temperament," according to Merriam-Webster. He and I complement each other nearly perfectly. Ron has an overall positive attitude, while I'm more of a negative person. Together, we balance out nicely, not unrealistically optimistic but not overly pessimistic, either. Ron is a terrific big-picture person, while I am great at all the details. Together, we see both the forest and the trees! We each have strengths to counter the other's weaknesses. Spouse 2: [snorts] How stupid is this! I've never read anything so ridiculous! Spouse 1: [surprised] What? You don't get this? Spouse 2: [equally surprised] What? You really think like this? Spouse 1: Well, yeah, doesn't everybody? Spouse 2: No way! How can you possibly think like this? Spouse 1: How can you possibly not? Spouse 2: Wow. That sure explains a lot. Even though we'd used dialogue to create a safe place in our marriage to discuss our deepest feelings, our conversations about Mars & Venus were often difficult. But we persevered and in the process learned a great deal about each other. We agreed that if we'd tried to read this book before our weekend, though, it would have been a disaster. Once we got through Mars & Venus, we turned to Stephen Covey's book The 7 Habits of Highly Effective People and worked our way through that one. We set a long-term goal for our marriage, one that sustains us whenever life gets tough. In the nine years since we went on our Marriage Encounter weekend, we have continued to work on our marriage. Our task has not always been easy, and life has occasionally handed us some seriously challenging events to deal with, but throughout we've been able to hold on to the core of what we learned on our weekend: We love each other, no matter what. I've been too busy to update in a while. Sorry! So some quick catching up is in order. Our local newspaper sponsors a Pick the Oscar Winners contest, and I won! I picked the correct winners in the categories of best actor, best actress, best supporting actor, best supporting actress, best director, and best picture, and for a tie-breaker, best foreign language film. Two other people also picked all these correctly, so the tie-breaker didn't work. A roll of the dice resulted in me being the first-place winner. I was really surprised when the paper's movie critic called me to tell me I'd won. What did I win? Well, something this dedicated moviegoer can really use: ten movie tickets and ten $5 gift certificates to a local restaurant! Ron and I have been seeing a lot of movies the past couple of years. We have date night every week, usually a weeknight, and most weeks we go to dinner and a movie. I think this year's best movie was Eternal Sunshine of the Spotless Mind. Charlie Kaufman won an Oscar for best original screenplay, and Kate Winslet snagged a nomination for best actress. But the movie was otherwise overlooked in the Oscars. Too bad. This quirky movie has an intense love story at its core, and the method of storytelling requires the viewer to bring along some brains—two things I really love in a movie. I highly recommend this movie if you can handle a little weirdness in your entertainment.